« Everybody has an opinion on Dr. Ford’s allegations; some are hyperventilating. 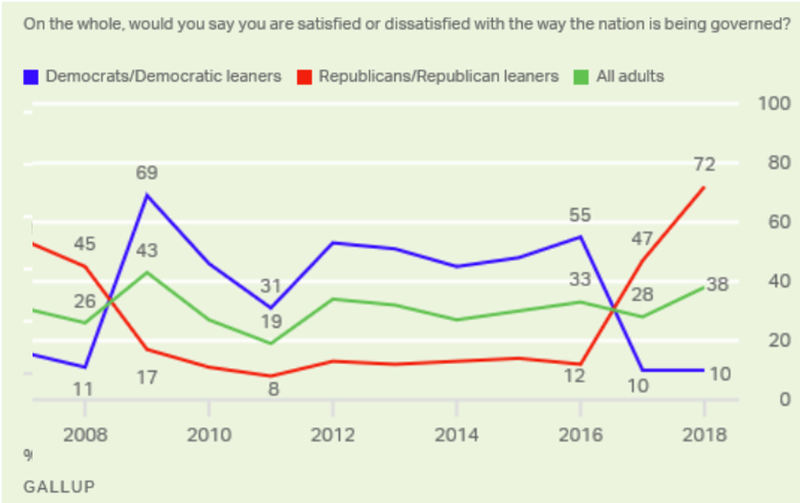 The typical MSM headline is “satisfaction is up 10 points, but still, 6 of 10 Americans are dissatisfied” … implying that Trump is perceived to be doing a bad job. That ignores an important historical perspective. During the Obama years, governance satisfaction averaged about 30% (which, I believe, is less than 38%) … and set a historical low in 2011 (19%). Note the sharp recent upward slope of the red line — Republicans’ satisfaction. During 2017 (Trump’s 1st year), GOP satisfaction bumped to 47% … roughly equal to Den’s satisfaction during the Obama years. In 2018, there was a 25 point bump to 72% … higher than the high water mark for Dems — 69% in 2009 ,,, the first year of Obama’s presidency. Again, Dem satisfaction (of the Obama administration’s governance) quickly settled in to about 50%. 72% of GOP are satisfied with the governance they’re getting from the Trump administration these days. Apparently, folks are happy to look past Trump’s personality issues, focusing on the man’s performance and his “promises kept”. Or, maybe they’re concluding that his abrupt style is what’s getting stuff done. This entry was posted on October 11, 2018 at 6:59 am and is filed under Obama, Polls & Surveys, Trump, President Donald J..	You can follow any responses to this entry through the RSS 2.0 feed. You can leave a response, or trackback from your own site.